Not to be confused with cardiac arrest or sudden cardiac death. An acute myocardial infarction, also called a heart attack, happens when a blood vessel in the heart suddenly becomes blocked. Blood vessels carry blood and oxygen. When a blood vessel in the heart gets blocked, blood cannot get to part of the heart. This part of the heart does not get enough oxygen. This is called ischemia. When the heart muscle becomes ischemic (does not get enough blood and oxygen), the ischemia often causes chest pain. This is called Angina Pectoris. If the ischemia lasts long enough, the heart muscle that is not getting enough oxygen dies. This is called an infarction. "Myocardial infarction" means "infarction (muscle death) in the heart muscle." A heart attack is a medical emergency. The first few minutes are very important for keeping the person alive. Some of the damage from the heart attack can be repaired if the person gets treatment during the first hour of the attack. Most heart attacks are caused by Coronary Artery Disease (CAD). In coronary artery disease, a wax-like material called plaque builds up on the inside walls of arteries in the heart. This is called atherosclerosis. Plaque is made of cholesterol and other cells. The amount of plaque increases slowly. As more plaque builds up, the insides of the heart's blood vessels get narrower. This means that less blood can flow through the blood vessels. This can cause platelets (which make the blood clot) to build up in front of the plaque. This causes a blood clot in the blood vessel. If the clot breaks free and gets stuck in part of the blood vessel made narrower by the plaque, the plaque and the clot together block the blood vessel completely. This makes it impossible for blood to get to part of the heart, and causes a heart attack. Heart attack: here, a blood clot suddenly gets stuck in one of the narrow blood vessels. Signs that a person is having a heart attack show over several minutes, and rarely come immediately. Most people having a heart attack have chest pain. Sometimes, people also have pain in the left arm, the lower jaw, the neck, the right arm, the back, or in parts of the abdomen. Many women have different symptoms than men. The most common symptoms include shortness of breath (trouble breathing), weakness, and feeling very tired. Some women feel tired, do not sleep properly, and have shortness of breath for up to a month before they have a heart attack. Women may also have nausea and stomach upset when having a heart attack. Sometimes, people have "silent heart attacks." These are heart attacks that do not cause any pain. They are more common in elderly people, women, and people with diabetes. In these people, suddenly feeling very tired, or fainting, may be the only sign of a heart attack. 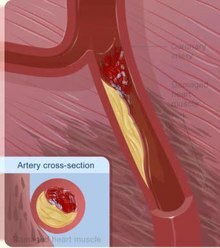 The animation shows how plaque buildup or a coronary artery spasm can lead to a heart attack and how blocked blood flow in a coronary artery can lead to a heart attack. A heart attack is a medical emergency that needs treatment as quickly as possible. The most important thing is to save as much myocardium (heart muscle) as possible and prevent more complications. As time passes, the risk of damage to the heart muscle increases. Aspirin. Aspirin is an early and important treatment for a heart attack. Aspirin keeps platelets from sticking together, and can help prevent more blood clots from forming inside the blood vessels and the heart. Nitroglycerin (nitro). Nitro widens the blood vessels in the heart. This makes it easier for blood to flow through those vessels to the heart. Oxygen (if needed). If the patient is having trouble breathing, oxygen can be given. Pain medicine for chest pain (if needed). Once doctors are sure that a person is having a heart attack, there are two main treatments: "clot-busting medicines" (thrombolytics) and percutaneous coronary intervention. "Clot-busting medicines" (called thrombolytics) can dissolve blood clots that are blocking the blood vessels in the heart. This makes it possible for blood and oxygen to flow again to the part of the heart that was not getting enough blood and oxygen. The most common clot-busting medicine is called tissue plasminogen activator (tPA). Clot-busters work best if patients get them within 30 minutes after getting to the hospital. However, if a patient gets a clot-busting medicine within 12 hours after the heart attack starts, they have a better chance of surviving. Clot-busting medicines do have some risks. Sometimes they can thin the blood too much and cause bleeding. Percutaneous coronary intervention is a way of opening blocked coronary arteries. Percutaneous means that the procedure is not done by cutting a person open in surgery. Coronary intervention means "way to help the heart". Percutaneous coronary intervention is also called "coronary angioplasty". In a percutaneous coronary intervention, a doctor threads a flexible tube into one of the patient's blood vessels, usually one in the upper thigh. The doctor threads the tube up to the blocked blood vessels in the heart. On the end of the tube is a balloon. The doctor blows up the balloon, which pushes the plaque and blood clot against the side of the blocked blood vessel. This allows blood to flow through that blood vessel again. Sometimes, a doctor might also place a small mesh tube called a stent into the blood vessel. The stent will make sure the blood vessel stays open and does not get blocked again in the future. The pain people feel is in the areas shown in red: Many people indicate the areas in dark red; those in light red are more rarely concerned. This image shows the chest from the front. The areas in light red are sometimes given as the place where pain is felt. This image shows the back. As soon as a person thinks they may be having signs of a heart attack, they should call emergency service right away. (Emergency services can be reached dialling 911 in the US, and 112 in most of continental Europe) However, the average person waits about three hours before asking for help. When a person waits to get help, they are more likely to have more serious damage to their heart. The American Heart Association says "time is muscle": the more time a person waits to get treatment, the more heart muscle dies. If a person is having trouble breathing, sitting straight up can help. The person should follow any instructions they get from the emergency operator or their doctor. ↑ 1.0 1.1 1.2 How is a heart attack treated?. National Heart, Lung, and Blood Association. Retrieved November 26, 2015. ↑ 2.0 2.1 2.2 Thrombolytic Therapy. Chen, M.D., Michael, U.S. National Library of Medicine - National Institutes of Health. Retrieved November 26, 2015. ↑ 3.0 3.1 Cardiac Catheterization. American Heart Association. Retrieved November 26, 2015. ↑ Heart attack first aid. MedlinePlus. Retrieved December 3, 2006. This page was last changed on 23 December 2018, at 03:04.